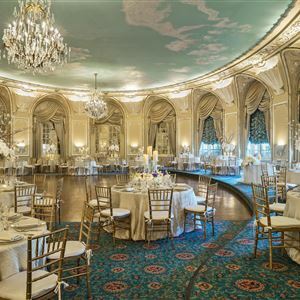 Property Location With a stay at Fairmont Copley Plaza, Boston, you'll be centrally located in Boston, steps from Copley Square and Trinity Church Boston. This 4. 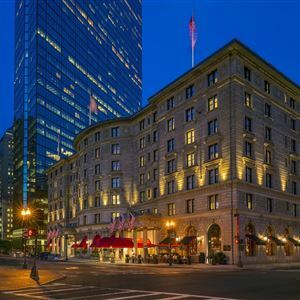 5-star hotel is close to Copley Place and Hynes Convention Center. Rooms Make yourself at home in one of the 383 air-conditioned rooms featuring minibars and LCD televisions. Your room comes with a pillowtop bed. Digital programming provides entertainment, and wired and wireless Internet access is available for a surcharge. Private bathrooms with shower/tub combinations feature designer toiletries and hair dryers. Amenities Enjoy recreation amenities such as a 24-hour health club or take in the view from a rooftop terrace. Additional features at this hotel include wireless Internet access (surcharge), concierge services, and babysitting/childcare (surcharge). Dining Satisfy your appetite at the hotel's restaurant, which serves breakfast, lunch, and dinner, or stay in and take advantage of 24-hour room service. Quench your thirst with your favorite drink at a bar/lounge. Business, Other Amenities Featured amenities include wired Internet access (surcharge), a 24-hour business center, and express check-out. Event facilities at this hotel consist of conference space and meeting rooms. With a stay at Fairmont Copley Plaza, Boston, you'll be centrally located in Boston, steps from Copley Square and Trinity Church Boston. This 4. 5-star hotel is close to Copley Place and Hynes Convention Center. Make yourself at home in one of the 383 air-conditioned rooms featuring minibars and LCD televisions. Your room comes with a pillowtop bed. Digital programming provides entertainment, and wired and wireless Internet access is available for a surcharge. Private bathrooms with shower/tub combinations feature designer toiletries and hair dryers. Enjoy recreation amenities such as a 24-hour health club or take in the view from a rooftop terrace. Additional features at this hotel include wireless Internet access (surcharge), concierge services, and babysitting/childcare (surcharge). Featured amenities include wired Internet access (surcharge), a 24-hour business center, and express check-out. Event facilities at this hotel consist of conference space and meeting rooms.